Under decree #100 of March 12, 1966 of Ministry of the Aircraft Industry the Experimental & Design Bureau, headed by Yurii N. Korolyov, was founded at the enterprise to draw up design documentation of Kh-66 missile. The flight working out was carried out between 1967 and 1968 and under decree #0075 of June 20, 1968 of Ministry of Defense the missile was put into service. During tests, the Experimental & Design Bureau started developing new “air-to-surface» missile Kh-23, which was ready for flight tests by the end of 1967. At the close of the 1960s specialists of Kaliningrad engineering plant mastered the production of R-40, R-40D and R-40D1 "air-to-air" missiles. Between 1960 and 1969 the enterprise expanded considerably; training building, shop of plastic were built, chemical-technological laboratory was founded, reconstruction of a casthouse was completed. Argon-arc-, contact- and roller welding of titanic alloy as well as casting and manufacturing of elements out of them, were mastered. New materials, such as epoxy glue, compound, sealant were used. The state tests of Kh-23 missile on MiG-23 and MiG-23B warplanes began on March 20, 1970 and continued till October 3, 1973. According to the results of the Kh-23 test launches, the missile was put into service in 1974. In early 1970s, there was a need in updated guided tactical weaponry. In this context, in 1971 the specialists of the Experimental & Design Bureau developed a principally new guidance system of airborne “air-to-surface” missiles by means of a laser ray. The latter was guided onto the ground target, which served as an orienting point for a seeker. The ray was produced by a laser system generator, installed on Su-17M-2, Su-17M-3, MiG-27 planes. The new missile with a laser seeker was named Kh-25 and was attributed to the promising directions of missile manufacturing. Its state flying tests were carried out on November 24, 1974, and in 1975 the missile was serially produced. In 1973 Victor N. Bugaiskii, Doctor of Technical Sciences, who had good experience in aircraft- and missile equipment development, was appointed head engineer of the Experimental & Design Bureau. Under his leadership the designs of Kh-66, Kh-23 and Kh-25 missile were analyzed, that led to development of a concept of aircraft guided missiles’ modular designing. In 1973 the works on forming rational module system started. In 1974 Vjacheslav A. Beljakov, who had been engaged in trade-union- and party activities before, was appointed director of Kaliningrad engineering plant. During the flying tests of Kh-27 missile, the Experimental & Design Bureau developed one more type of antiradar missile, Kh-31. Its designing began as early as in 1972. It was a unique missile for that time. The use of a principally new engine ensured a high-speed and ability to destroy a hostile antiaircraft missile system before the carrier aircraft will be detected and brought down. Between 1970 and 1975 expansion and upgrading of the basic production was going on. 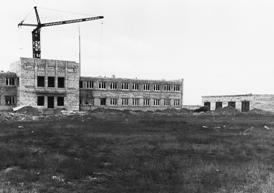 Several new shops were built, including the one of protective coating, x-ray control laboratory and storage facilities. The enterprise was equipped with the most up-to-date numerical control equipment, the building of a new titanic casting shop was under way. 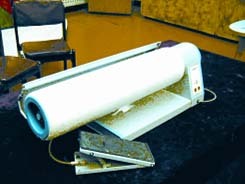 In 1974 the Experimental & Design Bureau received the first home-produced computers (BESM-4). Besides, the production of consumer goods also developed. In this context, a separate design bureau of consumer goods department was founded in 1972. In 1974 a process of a glittery nickel-plating of metal products was mastered. In 1975 the management of the enterprise made a decision on development and production of the first home-produced iron machine. Between 1975 and 1980 an active expansion of production and missiles' types was going on. In 1976 a new building of an assembling shop was put into operation, chemicals' storehouse and laboratory complex in Akhtubinsk were built, chief metallurgist department was reconstructed. In 1976 Kh-25 missile was put into service. Testing of Kh-27 missile continued during the whole 1976 and the first half 1977. Besides, in 1977 for the first time in the world practice tactical missile Kh-23 was really launched from a helicopter of a rotor coaxial system Ka-252TB. This year specialists of the Experimental & Design Bureau developed and presented a technical proposal on development of an anti-ship missile Kh-35 (later missile system "Uran" was equipped with them). Expansion of Kaliningrad engineering plant led to foundation on its premises of Kaliningrad production and design association “Strela”. Decree #459 of Ministry of the Aircraft Industry on reorganization of the enterprise was signed on November 2, 1976. The new association incorporated Kaliningrad engineering plant, Experimental & Design Bureau “Zvezda”, Kostroma mechanical plant and Bendersk engineering plant. In January 1978 a resolution #17 of Council of Ministers, and in February the same year a decree #60 of Ministry of the Aircraft Industry on development of an anti-ship missile Kh-31A, derived from Kh-31, were passed. The new missile intended to destroy surface ships with displacement of up to 4500 t, was equipped with an active radar guidance system and penetrating warhead. On August 7, 1978 Kaliningrad design and production enterprise “Strela” was renamed into Kaliningrad production association “Strela”.